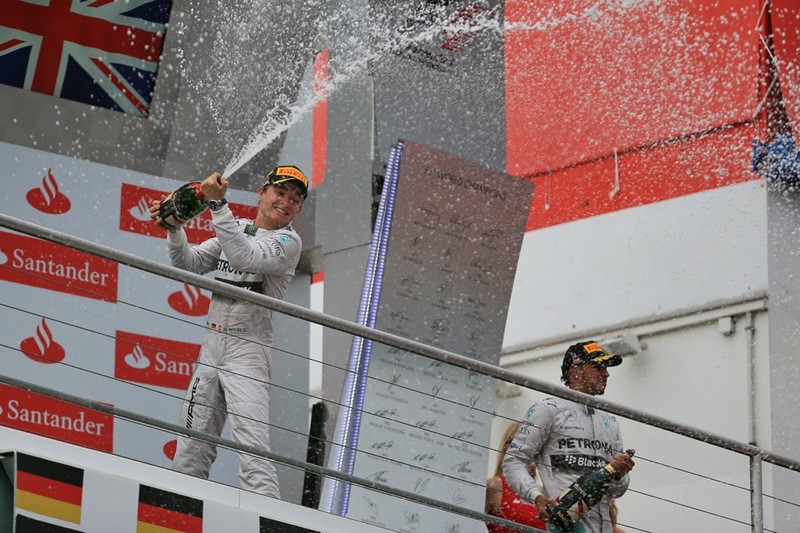 You are Nico Rosberg. You are young; handsome; devastatingly intelligent. You also are a very fine Grand Prix driver. You're sitting atop the Formula One World Drivers' Championship standings, driving a mighty fine - nay untouchable - car brought to you by a prestigious German marque. In the past two weeks you've got married, your country won the World Cup and the said prestigious German marque has extended its contract with you. And yesterday you won your home Grand Prix, easily, from pole. This extending your title lead by ten and adding a little more to the creeping sense that these months we are living through are your time in the sun. Yes Nico, life's pretty good for you right now. Indeed, the German race at Hockenheim wasn't really a race; not for first place at least. It was a lot like qualifying the day before, with his one rival in team mate Lewis Hamilton well dealt with Nico had something of an open goal. But again he volleyed the thing straight into the back of the net with some elan to emerge in P1. Some (including Rosberg himself) thought in advance that the mighty Valtteri Bottas-Williams combination might give Nico something to think about. But no - Nico smoothly and almost quietly moved clear lap after lap so that by his first pit stop after 14 racing tours he was ten seconds up the road. And untouchable. Nico acknowledged later that just lately has indeed been a rather special time for him, though still he remembered to get his priorities in order when asked which bit was the best part. 'That's getting married. That's definitely the case. That was the best feeling' he said. Long before the end even the FOM TV feed director had acknowledged that whom the victor was to be was a foregone conclusion. As Nico waved his arm to acknowledge the chequered flag it felt rather like the first we'd seen of him since the red starting signal went out all that time before. Yet given the minimum of fuss that he goes about most of activities I doubt the man himself will mind too much though. Much of the reason for the attention being away from Nico's demonstration run was that there was plenty of racing to divert us from second place downwards. The revised Hockenheim layout, despite its apparent deficit on popularity, actually has quite a good record on that one. As might be expected much of the diversion came from Lewis Hamilton. We usually can anticipate this, but with Lewis Hamilton being in a very fast car and starting way down in P20 it encroached the territory of racing certainty, and racing we certainly got. For the most part Lewis put into practice exactly what was required: firm, decisive, quick overtakes to complement his undoubted pace and spirit. There was one move however that I felt he was a little fortunate to get away with. 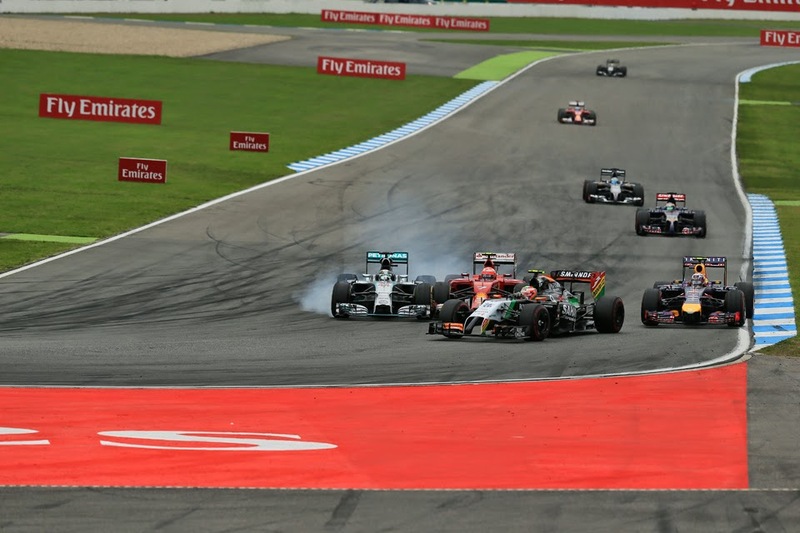 On lap 13 he slid past Kimi Raikkonen and Daniel Ricciardo in one move into the hairpin at the end of the long straight. Nothing wrong with that in itself, but it was via a rather brakes-locked, sliding-straight-on, car-barely-under-control moment with plenty of opponents around. It ended well for him and thus led to plenty of supportive whooping in response to the undoubtedly spectacular and edgy nature of it all, yet it struck me even so rather as an unnecessary risk for someone fighting for the championship, and who could barely afford a DNF (by the man's own admission, if he'd 'got caught in a collision with someone and lost points, that would have been really devastating'). The move rather seemed to be begging to have a front wheel ripped off - indeed he did hit Raikkonen, though the damage was to the Ferrari only - but mainly by chance so far as I could tell it didn't happen. What's more, given he clearly had stunning pace, was well on the way to a healthy points haul whatever and would have passed the cars in question shortly anyway (particularly so as neither was Merc-powered) it rather added to the skewed risk/reward calculation. Of course that he emerged on the other side largely unscathed led to most thinking that was that. But if his race had ended there one could only begin to imagine the fallout. Bad old impetuous Lewis would have been the mild part. It put me in mind of a variation of the words of French Marshal Pierre Bosquet upon witnessing the undeniable bravery yet also recklessness and ultimate futility of The Charge of the Light Brigade: it is magnificent, but it is not F1. Not fighting for an F1 title at any rate. Lewis would be best advised to quit while he's ahead on giving into such temptations. Earlier he'd had contact with Adrian Sutil at the same corner, which wasn't Lewis's fault at all (it looked like Sutil was being dozy) while later he also at that point of the track had contact with Jenson Button, born of a misunderstanding wherein Jenson's wide line led Lewis to believe that space was being made for him. Jenson, with all of the enthusiasm of a parent contemplating his errant teenage son's latest piercing, asked afterwards 'Why would we let anyone through? I don't know if you've noticed but a lot of drivers do that line to get a good exit from the corner'. He retracted later on further viewing however, and understood why Lewis might have thought as he did. Whatever was the case though that last rub came back to bite Lewis, or at least nibble at him. The resultant lost front wing endplate increased his front tyre graining according to Paddy Lowe, which necessitated an extra stop. It didn't help either that the final stop came early, anticipating a safety car after Sutil spun that against all expectations (and apparent logic) never materialised. 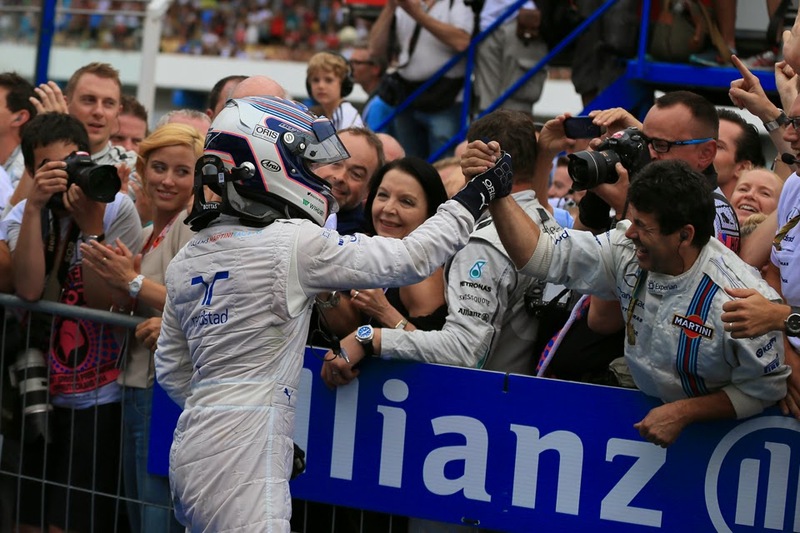 It all meant that there was one car between him and his team mate still not vanquished by Lewis by the end yesterday. That of Valtteri Bottas. Ah yes, Valtteri Bottas, who underlined in thick black lines once again that he really is the real deal, who'll surely win races and championships if there is any justice. 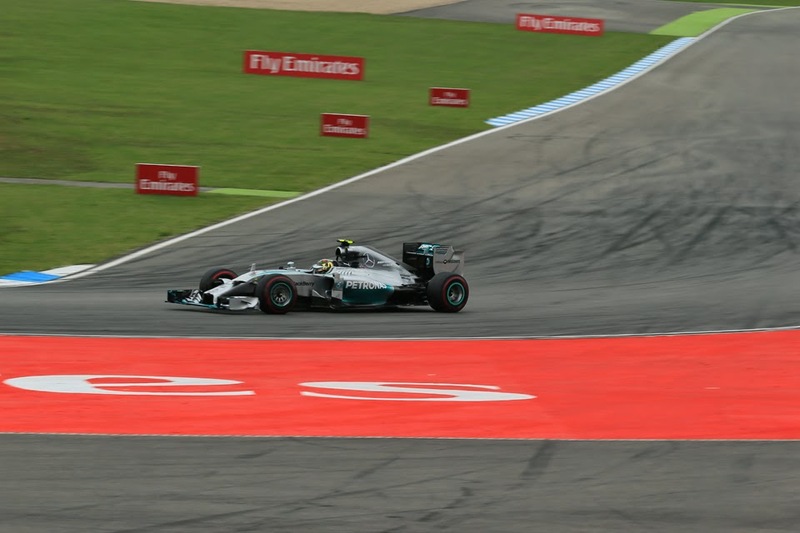 In Hockenheim he in what appears now regular phenomenon left all but the works Mercs behind and while Lewis despite everything got right with him with eight laps remaining, finally after a long drive from behind Lewis met his match. He never passed, nor really looked like passing, Bottas. The Finn was aided by being one of the quickest through the speed traps but being imperturbable helps also. This meant Williams leapt over Ferrari into third place in the constructors' table, and according both to Bottas and the team's Head of Vehicle Performance Rob Smedley this is the least of the squad's ambitions. Red Bull is next in the sights - an achievable aim given the Grove car is the marked best of the rest behind the silver lot right now - while Smedley reminded us that despite the fallow years 'the ambition of this team is to win the world championship eventually'. There was much fun behind too. A lot of it involving the effervescent Fernando Alonso, who once again appeared to have missed the 'F14 T isn't very good' memo, undertaking a typically tenacious-in-the-extreme run to fifth. Few disagreed when afterwards the Spaniard rated it as his best drive of the year: 'very pleased, very happy probably as Austria was the best race so far in the season for me, and now probably (it's) this one' he said. On the way he battled with either Red Bull, with the same spirit but thankfully shorn of the radio petulance from either party in Silverstone. The one with Daniel Ricciardo near the end - with Alonso attacking on newer, softer, tyres - was especially one to behold. Alan Jones watching from afar called it 'the battle of the two-never-give-ups'. It certainly looked every inch that, between the new(ish) boy and the old(ish) hand; both with maximised spirit but the ultimate in control and respect. Alonso had some kind words for Ricciardo afterwards too: 'Daniel fought very good, a lot of respect, always very clean, and I enjoy'. Ricciardo had to settle for sixth - just, after a photo finish thanks to Alonso fuel-saving on the final lap - and this after sinking to P15 from the off thanks to being caught behind an accident between Felipe Massa and Kevin Magnussen at turn one. 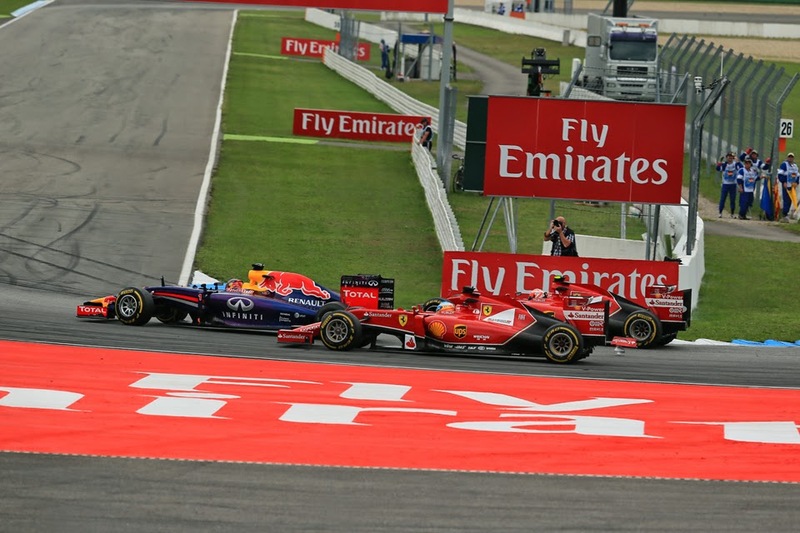 While Sebastian Vettel was further up the road, finishing fourth. Thus another win goes to Nico Rosberg, continuing the sense that Nico and victory have an almost magnetic attraction right now. Of course Lewis has had more of the misfortune lately but it would be harsh to call this all a cruise and collect from Nico; after all in two stats that may surprise Lewis hasn't outqualfied his team mate since the Barcelona round in early May, while that also is the only dry qualifying of any in which he's emerged ahead of the two this campaign. And whatever has happened in the meantime, almost never has there been that much between the Mercs on pace. Of course, plenty of racing remains - nine rounds and 250 points, with a few tracks Lewis excels at awaiting within it (one of which is the infamous 'double points' get-together). But as we stand now in mid-summer it's looking more and more like we're witnessing the summer of Nico Rosberg's F1 career.